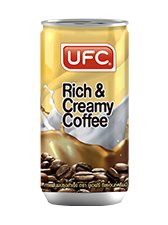 Rich & Creamy Coffee is made from high quality Robusta coffee blended perfectly with rich milk powder. Coffee is offering superior aroma and smoothed taste in can format. Enjoy yourself with great real coffee taste at anytime.